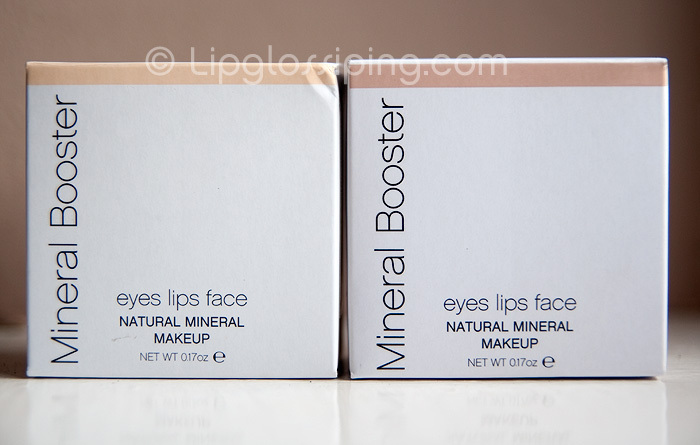 I received these two boxes of E.L.F’s new Mineral Booster through the post the other day courtesy of PR and my interest was piqued. I do love my mineral makeup. I will however, always hate the mess from playing with… what are essentially, little pots of dust. I already own the original version of the Mineral Booster which I bought about a year ago to use as an alternative to Bare Escentual’s Mineral Veil (it got superceded by my love for E.L.F’s HD Powder though). These new incarnations are pretty much the same thing as the original… but on steroids! Since I’ve become spoiled by Bare Escentuals new Click Lock Go packaging, I’m taking a point away from the E.L.F Mineral Booster ‘cos frankly, it’s a nightmare to transport. 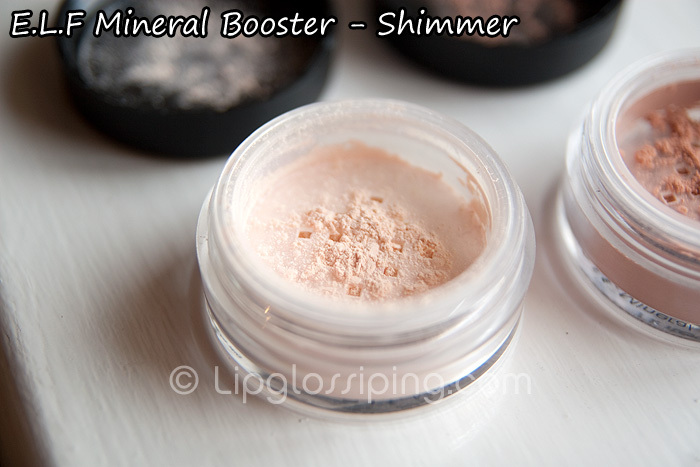 E.L.F Mineral Booster in Shimmer is an ivory toned powder with a healthy does of sparkle. Sneeze over this baby and you’ll be seeing stars for the foreseeable future! I was surprised at how creamy the powder felt to the touch. 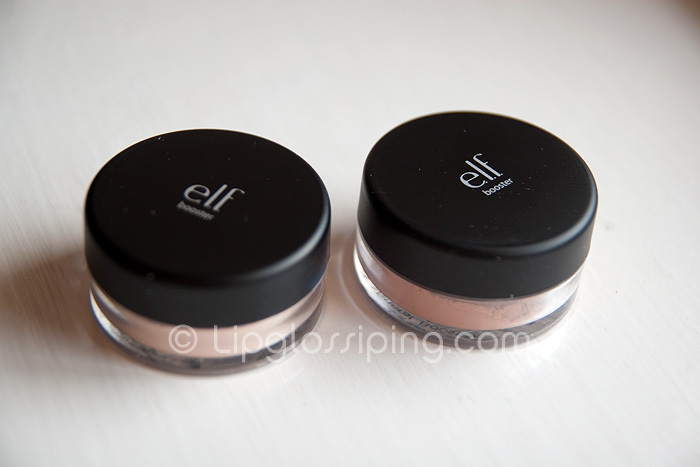 Obviously very finely milled… E.L.F never fail to impress me with the texture of their mineral products. 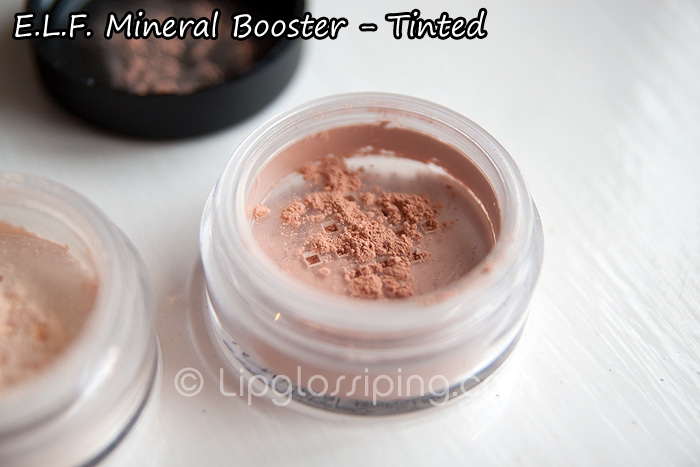 E.L.F Mineral Booster in Tinted is a warmer chocolate latté kinda colour… not quite dark enough to terrify me, but certainly deep enough to give me pause about applying it to my pale skin tone. Again, texture is great with no lumps or areas of heavier pigmentation. When I swatched both products, I felt a little disappointed. Not hugely inspiring are they? The Shimmer is pretty subtle on the back of my hand and the Tinted is just kinda Ovaltine-y. I wasn’t actually sure what I was gonna be able to do with them by way of demonstration to show you how they work. Faced with this… a lack of any technical skills whatsoever and my 10hr old makeup, I decided to just go for it. I grabbed a big powder brush and went for the Tinted version first. I chose a powder brush over my kabuki as I wanted something that wouldn’t deposit too much product. 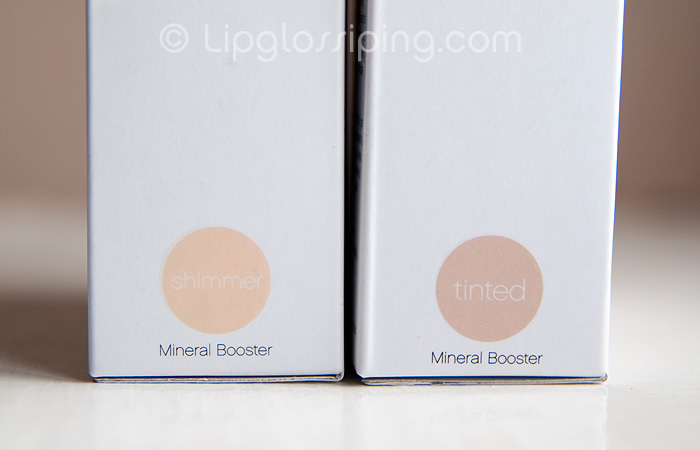 I needn’t have worried, Tinted is quite sheer when applied with a brush, it definitely gives you the opportunity to build without flooding your face with pigment. I applied a light layer allover, then built up the shading along my invisible cheekbones. I wasn’t too bothered about whether I was ‘contouring’ or ‘blushing’ – I was just slapping it on. Reaching for Shimmer, I focused on the high points on my face. Those imaginary cheekbones got a dusting, as did my nose and chin. Watching the sparkles float on the air I was expecting to see a beacon of glitter reveal itself to me when I looked in the mirror, but the effect was pretty subtle. Infact… I couldn’t really see any difference at all. I took an ‘after’ photo anyway and figured that I’d leave the review at swatches and the fact that I thought it was too subtle. Is it just ‘cos it’s mattified me or does the ‘after’ look smoother? More polished? I think it’s given me a hint of coverage (check the red nose)… but as a Mineral Booster, that’s not really it’s job description. Wait… what IS it’s job description? Achieve the ultimate, translucent “photo finishing touch” to your makeup, our Mineral Booster melts into your skin, infusing it with key vitamins A, B and E to promote healthier skin that’s noticeably silkier and smoother. Completely sheer and ideal for all skin tones, Mineral Booster gently absorbs oil and minimizes the appearance of wrinkles, fine lines and pores for a beautiful even finish. Wear alone or buff over our Mineral Concealer and Foundation to lend extra staying power and to achieve a professional and stunning porcelain matte look that will last all day. Oh right! Well, I guess it’s up for promotion then ‘cos that’s what I’m seeing…. though they aren’t gonna last you all day unless your middle name is Dust Bowl. Can you notice a difference? I can’t put my finger on what else it’s done. Considering the colour of ‘tinted’, it’s pretty subtle innit? All I know is, I prefer the ‘after’. At £3.50 a pot, these new E.L.F Mineral Boosters are getting the thumbs up from me. How long DID it last then? 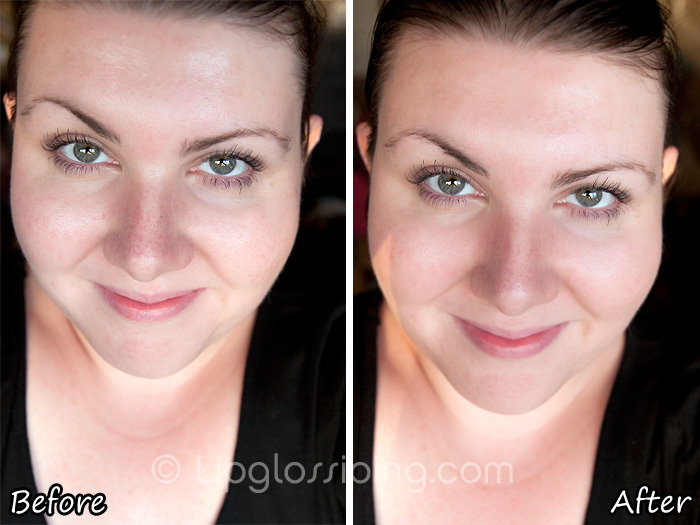 I´m the type that gets oily skin during the day, so the longer it lasts, the better. I think in the “after” you look more polished – pulled together, so it’s obviously doing something. Looks nice but i’m still a bit confused about mineral products like these! Great tip from Oxford Jasmine there. love your lashes / mascara!! !